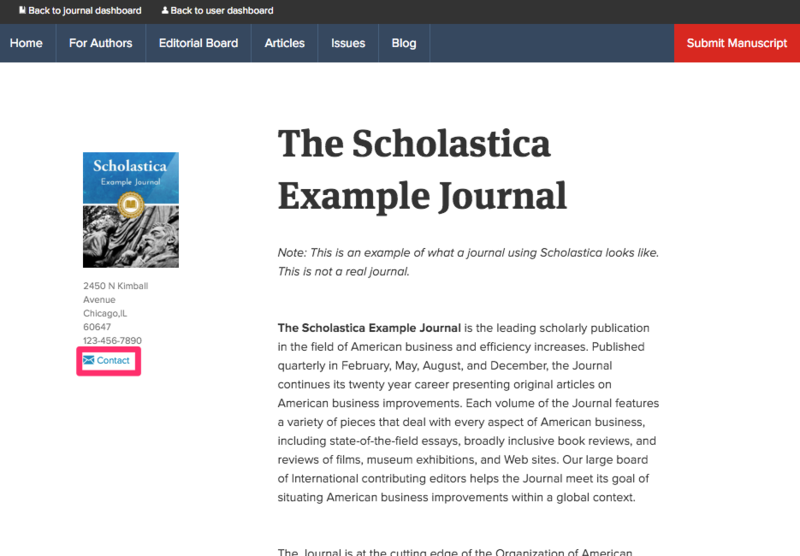 Authors using Scholastica can submit articles to an ever-growing pool of scholarly journals. Browse journals and their submission guidelines, communicate with editors, submit articles, and receive reviews and decisions all on the web with Scholastica. Go to https://submissions.scholasticahq.com and click "I need to sign up" if you haven't yet created an account. If you already have a Scholastica account, you don't need to create a new one! You can simply log in, instead. If you cannot remember your password, click "Forgot Password". After first signing in, you'll be taken to your Dashboard where you can submit a manuscript, create a journal account, and see the latest posts from the Scholastica community. This guide offers concise instructions and detailed video walk-throughs for authors' most common uses of Scholastica. From your Dashboard, click Submit a manuscript or Browse Journals. Type the name, discipline, or subject matter of a journal into the search bar and click Search or browse the list below. From your Dashboard, click Submit a manuscript. Find the journal you'd like to submit to and click on it to visit the journal's profile. NOTE: This step is slightly different for law reviews. Read more: Can authors submit to more than one law journal at a time? Click Go to submission pool on the browse journals page. Find the law reviews you'd like to submit to and click each one. As you select law reviews, they will appear in your "cart" on the right. On the journal's profile, click For Authors to read the submission guidelines. When your manuscript is ready, click Submit Manuscript. Enter your manuscript’s details. The article title, abstract and keywords are required. As you type keywords, make sure to type a comma after the keyword itself. Upload your primary manuscript file by clicking Choose file and navigating to it on your computer. Once you’ve selected the file, click Upload file to finish adding the file. Read more: What file types do you support? Your author details will already be filled as the primary contact author. You can add additional authors by clicking Add another author and entering their information. The additional authors cannot log in to access the manuscript or read any reviews that may be shared -- that is restricted to the primary author. Enter your credit card information. You may not be prompted to complete this step depending on the journal's configuration or if your submissions are subsidized by your institution. On the Confirm and Submit page, double-check the details you’ve entered. If you need to make any changes, click Go Back. When everything looks correct, click Submit Manuscript. You'll be brought back to your dashboard and sent a confirmation email. How do I tell if my article has been submitted successfully? I misspelled words in my document, can I switch out the file? What information about authors do editors have access to? Read more: What file types do you support? From your Dashboard, click My Manuscripts. Find the manuscript and click Manage Submission. Enter a description, and click Add file to select the file. Click the Save new file button. Click Withdraw manuscript and then click OK to confirm withdrawing the manuscript. Journals can be contacted via email on their profile pages. You can search or browse journals on the browse page. Click "Contact" on the journal's profile page; an email message to the journal’s primary contact will be opened. After you've submitted your manuscript, you can start a discussion with the journal about it in the Author Work Area for the manuscript. Read How do discussions work? to learn how. 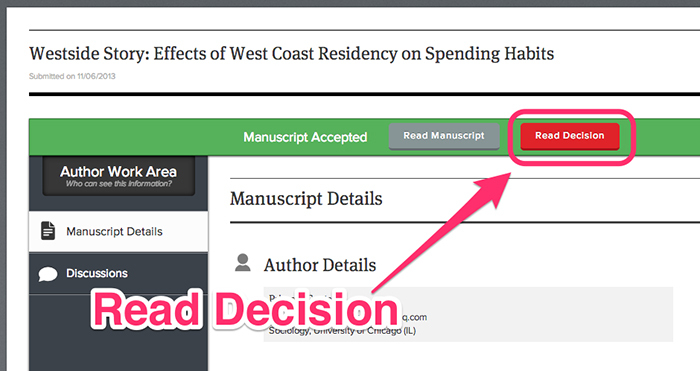 You'll be notified of publication decisions via email and by an alert on your Dashboard. To view a decision from your Dashboard, click My Manuscripts. If you have received a decision of "Revise & Resubmit", you will have the option to re-submit the manuscript. Once you've made any requested changes to the manuscript, you can resubmit it via the Manuscript Details page as well as directly from your dashboard. To resubmit from your Dashboard, click the Submit Revised Manuscript button. The manuscript will also be listed on the My Manuscripts page. Click My manuscripts and then find the manuscript. Click Manage Submission. Click Submit a Revised Manuscript. Edit the manuscript details if necessary like the manuscript title, abstract, and keywords. Upload the revised file by clicking Choose file and navigating to it on your computer. Once you’ve selected the file, click Upload file. Learn more about submitting to law reviews and managing your law submission in our law author guide: "Everything you need to know to manage your submission: A guide for law authors"
Sponsorship allows your institution (e.g. university, department, company) to automatically cover your submission fees. 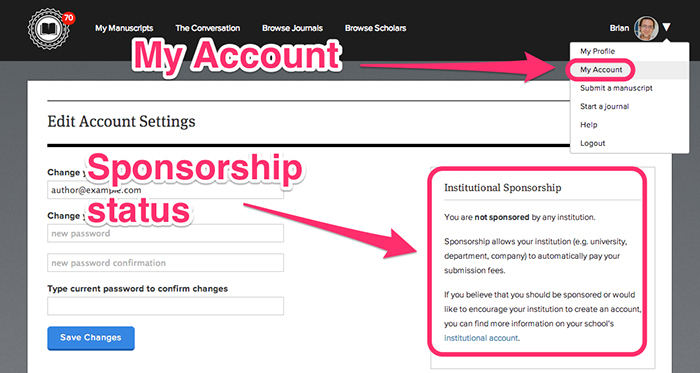 Check if you are sponsored by your institution by clicking My Account. If you believe that you should be sponsored or would like to encourage your institution to create an account, you can find more information on your school's institutional account here. You may also request an economic fee waiver if you cannot pay the cost of your submissions due to financial hardship. To request a waiver, please email support@scholasticahq.com. Receipts for submission fees (if you are not sponsored by your institution) will be automatically sent to your email. To check them from your Dashboard, click My Manuscripts. 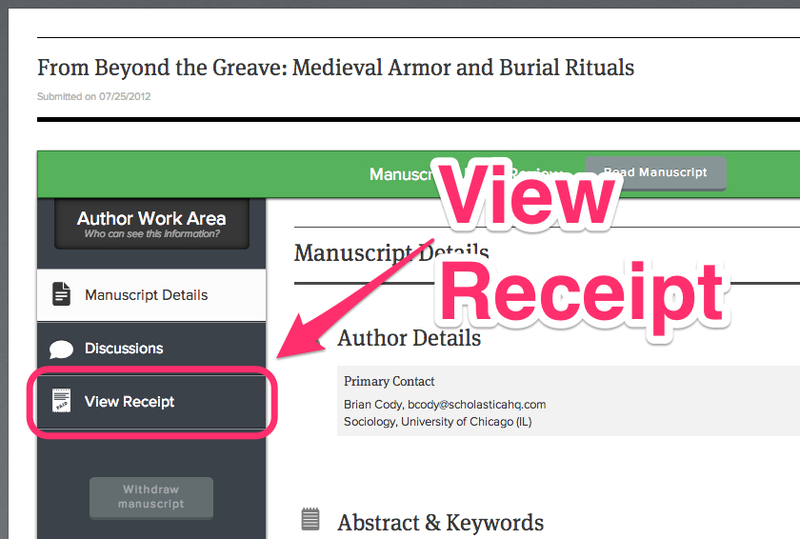 Find the manuscript for which you'd like to see the receipt and click Manage Submission. 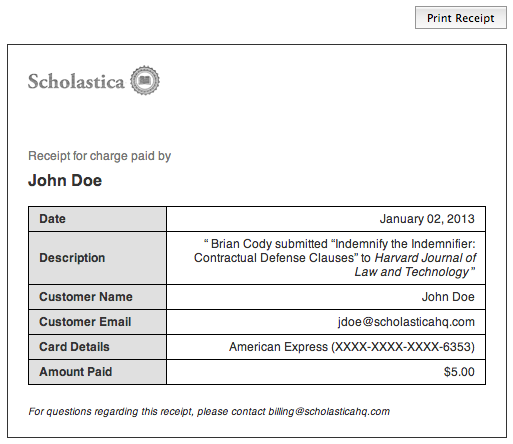 In the Author Work Area, click View Receipt.